Tomorrow night, Bernard Hopkins will add another chapter to his extraordinary career and put another line in the record books; the Guinness book that is. Considering that Hopkins is 48-years-old, his participating in a championship match, no matter the opponent, is a record-setting milestone. Win or lose, the fact he continues to compete is remarkable. But take away the age factor, and this is a contest few in boxing, and no one outside of the sport, cares about. Who is Karo Murat anyway? Bernard Hopkins has nothing left to prove as a boxer. The fact he thinks he does has to be one of the stranger and more poignant spectacles in all of professional sports. There’s something sad about a competitor who is never satisfied with his accomplishments, who cannot come to terms with the fact that all stories must, at some point, end. Fer cryin’ out loud, the guy is almost 50 years old. Chances for a satisfying ending have come and gone. The perfect moment would have been back in 2007. His long reign as middleweight champion concluded by two tedious waltzes with Jermain Taylor, Hopkins impressed everyone and erased the bitter taste of defeat with a surprisingly one-sided win over light-heavyweight champ Antonio Tarver. A solid 3-to-1 underdog, Bernard schooled the younger man in almost every facet of the game to both win another title and further establish himself as a modern day great. At the time, Hopkins had in fact indicated this would likely be his final ring appearance and after his surprising win the applause from both the public and the media was loud and long. An exit at this particular moment would have been classy, dignified and aesthetically satisfying. But it didn’t happen. Instead what did happen was an inconclusive and forgettable affair with Ronald “Winky” Wright, definitely not a bout or performance from which one wants to ride off into the sunset. The next perfect time to call it a career was the following year when Hopkins took another youngster to boxing school, dominating highly regarded Kelly Pavlik and making most forget all about Bernard’s loss to Joe Calzaghe six months before. Some had predicted that youth would finally triumph over age as Pavlik had looked impressive in his wins over the same Jermain Taylor who had taken Hopkins’ middleweight crown, but the bout was barely competitive. Once again, Bernard’s ring smarts and experience proved too much for a more powerful but less skilled fighter and “The Executioner” had added another significant scalp to his Hall of Fame worthy collection. Had Hopkins at that point chosen to move on, pick up a microphone and take his seat next to Larry Merchant and Jim Lampley, boxing would have been spared the ugly spectacle of his foul-filled rematch with a washed-up Roy Jones Jr., as well as the ugly spectacle of Roy Jones Jr. picking up a microphone and taking his seat next to Larry Merchant and Jim Lampley. Alas, Bernard decided to fight on. Which led to the next perfect time to call it a career. Jean Pascal was viewed as a talented and quite legitimate light-heavyweight champion and more than a few foresaw an ugly end to Hopkins’ career against an opponent bigger, faster and stronger, but the ageless wonder put on an inspired and inspiring performance, rising from two knockdowns to sweep the late rounds and salvage a draw on Pascal’s home turf. Despite the knockdowns, most observers thought Hopkins had been robbed of an historic win, so an immediate rematch was set, again in Quebec. Those who thought Pascal might learn from the mistakes of the first bout were themselves mistaken as the old champ completely psyched-out Pascal before taking a clear-cut victory, becoming the oldest boxer to ever win a world title. At this point many thought that finally, here was the perfect time for Hopkins to blow kisses to the bleachers and, festooned with title belts, walk away, satisfied in all he had accomplished. But, no. Instead we got the ugly spectacles which were his matches with Chad Dawson, pointless, foul-filled affairs which did neither man, nor the sport, much good. In the first bout, Hopkins was thrown to the canvas after tackling Dawson in the second round and suffered a separated shoulder, the non-fight eventually ruled a no-contest. In the rematch, Dawson out-worked the older man, who resorted to frequent head-butts, to take a legitimate points win. But there was Hopkins after the fight, a match which drew fewer than eight thousand spectators, petulant, complaining about being robbed and, naturally, refusing to retire. No doubt some people got genuinely excited when Hopkins won yet another world title by outpointing Tavoris Cloud this past March, though who those people would be exactly, I’m not sure. Cloud, who fought as if he were impersonating a cooperative sparring partner, hasn’t looked good in years, but it didn’t matter. The focus was on Hopkins making history again and continuing to compete on the championship level. But it was difficult to ignore the general sense that the story had gone on too long, the narrative becoming tiresome. What was left to say that hadn’t already been said umpteen times? Besides, the fight itself was as routine as a gym workout and about as stirring. Hopkins won another championship. Yes, it’s remarkable. So. What’s next? What’s next can only be deflating. The opportunity for something satisfying has passed, several times. Hopkins, who still rails about how everyone hates him and wants to squeeze him out of the fight game, now says he wants to unify the light-heavyweight titles before finally walking away. The possibility of all of the different players involved — sanctioning bodies, networks and promoters — coming together to make such a series of matches feasible is slim to none. But beyond that, Bernard Hopkins is almost 50 years old. And call me crazy, but the last thing I want to see is a 50-year-old man in the ring with a truly dangerous customer like Sergey Kovalev. Or Adonis Stevenson. 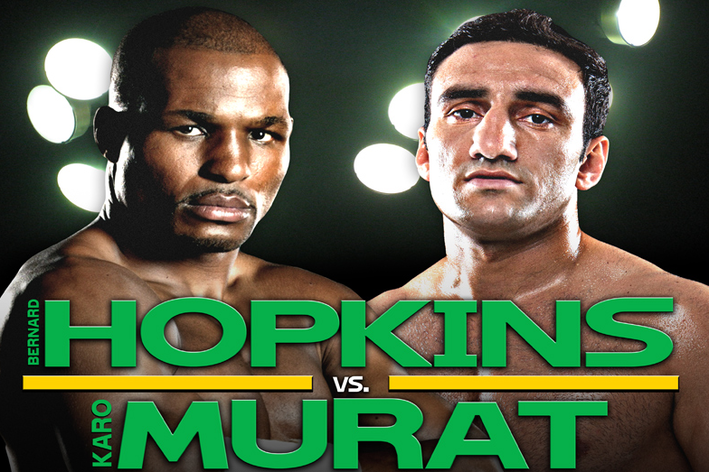 Could Hopkins neutralize their power and make them look bad, as he did against Tarver, Pavlik, Pascal and Cloud? Maybe. But he might also get hurt. This is boxing, after all, the most dangerous of sports. All it takes is one punch. And for what? Truth is, Bernard could get hurt tomorrow night. And if he did, everyone would be asking that same question: for what? The man has done it all. At what point is he pushing his luck? Bernard Hopkins is a multi-millionaire. His life story is the stuff of novels and movies. He emerged from prison, doggedly pursued his ambitions, and fully redeemed himself. He ruled the middleweights for almost a full decade, won six world titles, defeated a slew of champions including Oscar De La Hoya and Felix Trinidad. His place in boxing history is more than secure. It’s long past time for this esteemed champion to finally put down the punching mitts and pick up a microphone. Or a promoter’s license. Or a pen to write his autobiography. Or better yet, maybe a bag of cheetos and a cold brew as he, at long last, kicks back and — basking in the sun, content and at peace with himself — enjoys a well-earned retirement. It would be fitting; it would be dignified; it would be sensible. Sadly, if he keeps fighting, the final outcome could be anything but.